Should we uninstall the old client? and I did not apply the last HF. does this HF include all updates till now? Thanks again for your support and we will see you all in 2017 with some major news! Oh, my... That's leaving me all giddy! Congrats for the GREAT work to everyone at Lockheed Martin! @randy , yes you should read the news (as linked by Elaine) and the install instructions, uninstall client , reinstall client .... and yes the HF is cummulative. PS: first time LM gives us a hint!!! great news and something to look for!!! Prepar3D v 3.4 Hotfix 2 has been Released and available to Download . First: Uninstall the existing (Old) Client in your Control Panel "Programs and Features"
Delete your Prepar3D.cfg, When you Launch Prepar3D it will build a new Prepar3D.cfg returning your Graphic\Scenery settings back to Default, Simply go back into your Prepar3D\Settings and adjust your Graphic settings to your liking. You can check and confirm at any time what Version of Prepar3D You have Installed ---) What Version Of Prepar3D Is Currently Installed ? I followed LM instruction to the T. When I went to install the H-Fix I got the following error. So I go and find this NET Framework download on the Microsoft site and when I install it it says It is already installed on the computer. How do I fix this. Not only should you uninstall the old client, you must uninstall the old client before installing the new one. And yes, all new releases are cumulative. But before you update, make sure that any addons you might have support the new version. What was the answer to your Issue ? (1) First Uninstall the Prepar3D v3 Client and Content in your Control Panel "Programs and Features"
When completed, Follow this from the above post "Action's to take after you Update with the Client"
Forgive me, if I've got a stupid question, I'm a little bit unsure to install the update, because I've never done it before. I've installed V3.2. Am I able to update just by installing the new client? Or must I install the client of 3.4 as well? 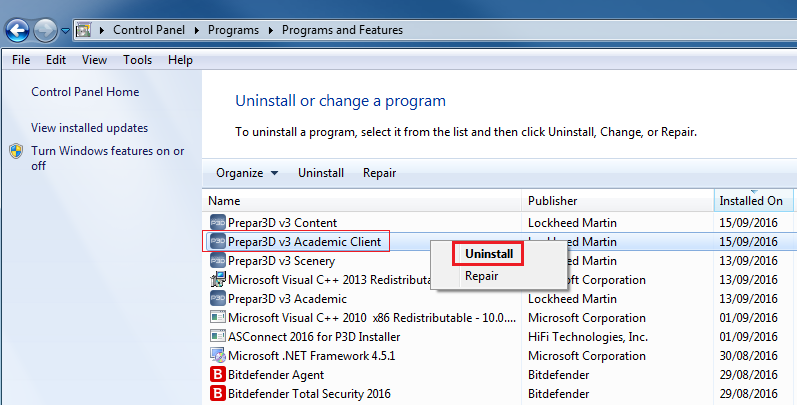 If you have installed v3.2, you need to uninstall the client related to v3.2. Then you can directly install the v3.4.18 client (it usually takes a few seconds). Thanks for the fast reply! I'll give it a try! It is my first post. I would like to try other version why the latest is not working correctly in my PC.